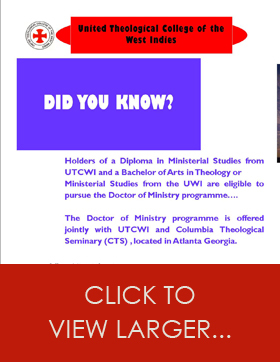 The library of the United Theological College of the West Indies began in 1967 with the amalgamation of the libraries of the three colleges which merged to form the institution - Union Theological Seminary, Calabar, and St. Peter’s College. The collection then comprised 8,700 books, 35 bound volumes of periodicals and several incomplete sets. The collection currently has approximately 39,000 books, 130 periodical titles, newspapers and information files and audio-visual materials. The library carries a wide range of subjects within the Philosophy and Religion subject area of the Library of Congress Classification scheme and a small collection in sociology and history. Special collections include the West Indian Collections which contain publications about the Caribbean or by Caribbean writers. Theses prepared for higher degrees and Caribbean Studies done by students for the B.A. Theology are also a part of this collection. Audio-visual collection is growing steadily. The books are classified by the Library of Congress Classification Scheme that was adopted in 1980. The books from the amalgamated collection and those acquired up to 1980 are classified under the old Union Theological Seminary Scheme. Separate card catalogues are maintained for these books while the books acquired after 1980 are now on the OPAC and can be searched for electronically. New students are given an orientation to the library so that they may learn early to work with both systems. 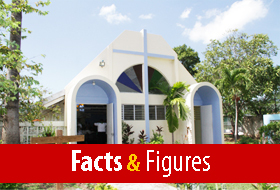 The library serves the UTCWI and St. Michael’s Seminary communities and is a part of the network of the UWI (Mona) libraries and students of that institution use its facilities. Loans of materials are however restricted to those students who are doing courses at UTCWI. Graduates and pastors who wish to do research, high school students preparing SBA’s in Religious Education and other persons from other theological colleges wishing to do research are allowed to use the library. The library is located on the South Western block of the quadrangle and is the only two storied building on the Administrative block. The opening hours are 8:30 a.m. to 4:30 p.m. Monday to Friday during semester break. During the semester with the assistance of students the opening hours are 8:30 a.m. to 10:00 p.m. Monday to Friday and 9:00 a.m. to 4:00 p.m. on Saturday. The library facilities are being expanded to house a Centre for Caribbean Theology, a Ministry Resource Centre, an improved Audio-Visual room, more staff workroom space, a graduate seminar room, upgraded technology for faster internet access to online databases and resources, improved patron study areas and wireless access. APA - American Psychological Association style is a set of rules that authors use when submitting papers for publications in APA journals. Chicago - There are two basic styles (1) notes and bibliography used by scholars in the humanities, and (2) author-date used by those in the physical, natural, and social sciences. MLA - Modern Language Association style for documentation is widely used in the field of humanities. MLA is sometimes considered simpler and more concise than the other styles. Harvard Referencing Style - The system incorporates references to the source material in the text and thus they are more easily read in context with the sourced material. Citation Machine - Provides an interactive tool to help create reference citations for research papers. EndnoteWeb - A web-based service designed to help students and researchers through the process of writing a research paper. Zotero - A powerful, easy-to-use research tool that helps you gather, organize, and analyze sources and then share the results of your research.